Now is your chance to own a home in a great family neighborhood on the north end of Chico! Located just off Eaton rd, the quaint little street of Keith Hopkins Place, houses only [about] 35 homes total. 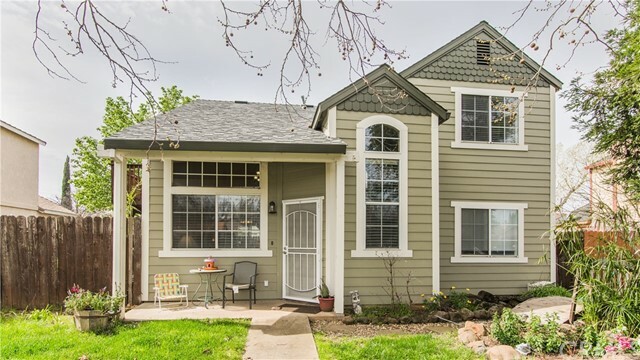 With no through access, this community has a sense of privacy, yet close to Upper Bidwell Park, grocery stores and great schools. This home features 3 bedrooms, 2 bathrooms, plus an extra bonus room, making it just over 1400 square feet. When you walk in the front door you immediately notice the high, vaulted ceilings, open floor plan, and bright atmosphere. Plus, the new [aug. 2018] HVAC unit will keep you cool in the summer heat! The enclosed yard is great to let your pets run around, while you BBQ & entertain in the privacy of your own yard. The master bedroom has its own balcony providing you with the perfect space for catching some rays, practicing yoga, or enjoying your morning coffee. Make an appointment to see it today!